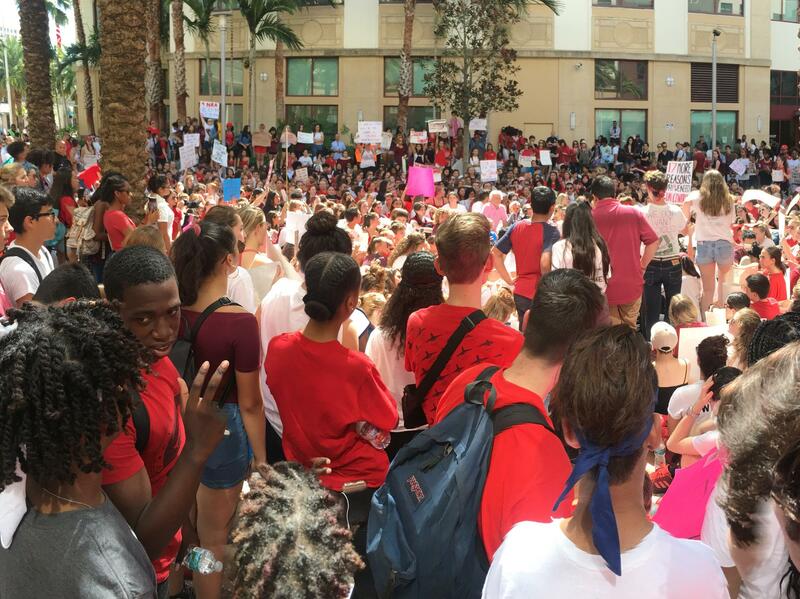 Marjory Stoneman Douglas High School sophomore Gabe Glassman speaks at a rally at Alexander W. Dreyfoos School of the Arts in Palm Beach, Fla. 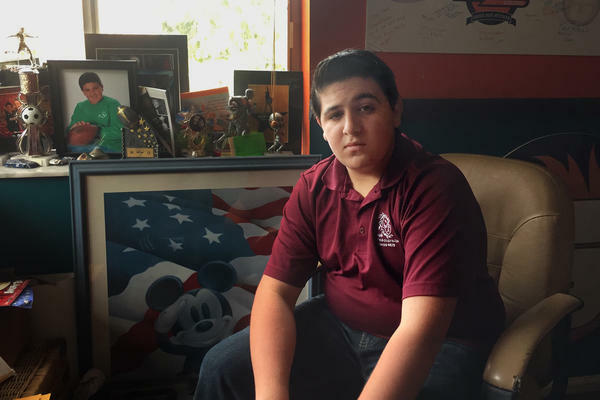 The 15-year-old survived the school shooting that left 17 dead. Students go back to class tomorrow at Marjory Stoneman Douglas High School in Parkland, Fla. It will have been two weeks since 17 people were killed in a shooting there. Fifteen-year-old Gabe Glassman is a sophomore at the school, and Youth Radio worked with him to capture what it feels like for teens who are trying to both make their school safer and lead normal lives. GABE GLASSMAN, BYLINE: The past few weeks, my house has been command central for supplies for teachers whose rooms were shot up and may never be reopened. LISA GLASSMAN: More markers into Conor's car. Conor's car is taking markers. G. GLASSMAN: This is my life now - helping my mom organize supplies from around the country, then meeting up with friends before counseling. UNIDENTIFIED GIRL #1: Oh, my God, did you guys bring food? UNIDENTIFIED BOY: I brought some munchkins and coffee. G. GLASSMAN: Then speaking at a rally or visiting memorials in the park, then going on social media to check out my posts about gun control. So I'm checking Twitter right now and over 2,200 people have seen my tweet. And 46 people have liked it. Twenty-eight people have retweeted it. And now I'm wondering what my other tweets look like. So I'm going to go to - ooh (ph), this is my mom. (Unintelligible) Hold on. Hey, Mom. G. GLASSMAN: My mom's been checking in with me a lot. Her name is Lisa Glassman. L. GLASSMAN: OK, so how are you feeling right now for real? Tell me what's going on in your mind and stuff. G. GLASSMAN: A lot. A lot is going on in my mind, obviously. There's so much that I have to think about - going back to school, me and my Twitter life, my activist life. ALEX WIND: This is definitely part of coping, not necessarily grieving. G. GLASSMAN: That's my friend, Alex Wind. We're in theater together. But now he's more famous for his activism. He helped start the #NeverAgain movement after texting with friends. WIND: As much as we're doing all these interviews and doing all this stuff, we're still kids. And we were in that school. G. GLASSMAN: #NeverAgain grew from a hashtag on Twitter to a March for Our Lives scheduled for next month in Washington, D.C., and around the country. It's a lot to handle. WIND: There are hundreds of messages at all times. And we're trying our hardest. I - we're all so busy all day long. G. GLASSMAN: While we've been out of school, it seems like everyone has been part of this movement. I'm speaking, tweeting and writing letters to government officials, and I'm not even one of the organizers. WIND: There's no central leader. It's a team effort. And I think that's what's most important. You know, we'll split up and we'll say, OK, this group, let's do this thing. This group, do this thing. ARIANA ORTEGA: So we have many group chats where we have students speaking about legislative stuff, emotions, plans - everything. G. GLASSMAN: That's Ariana Ortega. She's a senior. ORTEGA: Two weeks ago, we were all going prom dress shopping, looking at - sending each other pictures. All of those things seem so insignificant now. G. GLASSMAN: Well, that's what happens when your life changes that fast. I had to hide in a closet for an hour and 20 minutes and get evacuated by a SWAT team. My neighbor across the street, Amanda Edwards, was in the freshman building where the shooting took place. She's been more private since then and finding comfort in writing and her piano. G. GLASSMAN: Her close friend, Carmen Schentrup, was killed. She still vividly remembers seeing her in the hallway a few days before everything happened. AMANDA EDWARDS: I remember coming out and seeing her. And, you know, she kind of slowed down a little because she saw me and she said, you know, hi. And I said hi. I remember saying goodbye. And that was the last time, you know, I saw her - at least alive. G. GLASSMAN: Amanda says a lot of her friends don't plan on going back to school, at least on the first day it's back open. EDWARDS: My dad said that, you know, if I ever get scared during the school day on Wednesday or after that that, you know, I'm fine with leaving early and stuff 'cause, I mean, what's the point of being at school if we're just freaking out half the time that there might be a school shooter again coming in? G. GLASSMAN: I get it. I was anxious to go back even for a few hours. They let us come back and get our stuff. When the shooting happened, so many of us ran out without our phones and our backpacks. I actually felt relief getting everything back. I recorded the moment on my dad's phone. G. GLASSMAN: And I'm so happy. Everything's here - my phone, my wallet, my computer. Yay. Everything may change tomorrow when we go back to school. I don't know if I'll stay this involved. On a personal level, all this political activity is helping me cope. Without all the activism going around the community, I'd still be in the background or sitting in bed. Some moments are easier than others, and it's hard to explain to people who haven't gone through this. I talked to my friend, Sawyer Garrity, about that. What would you say now to another teenager who's feeling numb? G. GLASSMAN: Someone who hasn't experienced this. GARRITY: OK. It doesn't feel like it could ever happen to you until it does. It still doesn't feel real even if it does happen to you. G. GLASSMAN: I don't know what it will feel like tomorrow back at school. It might be good that we'll be busy all day and back together. But I know it will be hard just to walk on campus. For NPR News, I'm Gabe Glassman. CHANG: That story was produced by Youth Radio. Transcript provided by NPR, Copyright NPR.